In November 2015, the Republic of Korea Navy deposited 4,908 volumes of 1,013 types of rare antique books that were once in the collection held by the Republic of Korea Naval Academy to the Kyujanggak Institute for Korean Studies at Seoul National University. The Navy had initially discovered the antique books after they had been left abandoned in Seoul during the Korean War. The collection was then moved to the Republic of Korea Naval Academy in Jinhae in early 1951, and has been stored carefully for around 60 years. The Naval Academy has now donated the books to the Institute to ensure a more scientific preservation and management regime and for their usage as research material. 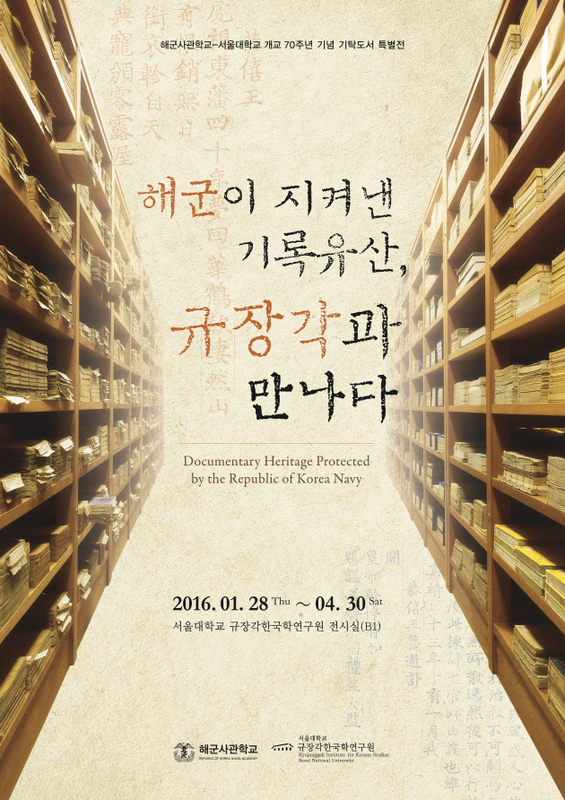 Held under the theme of ‘Documentary Heritage Protected by the Republic of Korea Navy,’ this special exhibition aims to celebrate the Navy’s donation of books and to promulgate the content and significance of the deposited books. The books donated from the Academy are not limited to certain subjects but encompass various categories, including many valuable books such as rare volumes printed prior to the Japanese Invasion of Korea in 1592. This exhibition places emphasis on showing the academic value and meaning of the donated books, and the high standard of archival culture among the ancestors of the Korean people, which is demonstrated therein. In addition, the exhibition will serve as an opportunity to showcase the efforts of the ROK Navy for the safe preservation of precious documentary heritage.